“What is the biggest room in the world? The room for improvement.” It is a quote Pat Fitzgerald, one of Gaynor’s physical education teachers, likes to share often with his students. 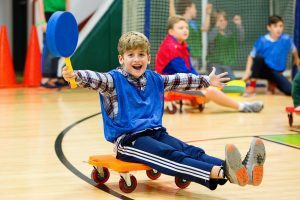 While physical education classes can help improve fitness, they also can have positive benefits beyond the physical. For students with learning differences who can and often do struggle with self-esteem, social skills, and confidence, the benefits can be even more critical and sometimes even life-changing. As an example, Fitzgerald can point to a current student at Gaynor who has not only improved his skill set but also grown tremendously on and off both the basketball court and baseball diamond. Fitzgerald says he has gained confidence and feels as though he can compete with anyone. This article was originally published in the Summer 2018 issue of Gaynor Gazette, which can be viewed here.